How would you describe your day today? Has it been a typical day, a particularly good day, or a particularly bad day? As part of the Pew Research Center’s annual Global Attitudes survey, this question is usually the first we pose to respondents in all the countries we survey. One reason we ask such a milquetoast question first is to help the respondents become more comfortable with the interviewer. The vast majority of the polls we conduct are done with face-to-face interviews in the respondent’s home, and asking about their day is one way to kick off the conversation. Having said that, the question is not necessarily a throwaway. Looking at the responses we received this year from 48,643 people we surveyed in 44 countries provides a glimpse of the mood of individual nations and even regions of the world. A median of nearly two-thirds (65%) across the countries surveyed in spring 2014 responded that they were having a typical day. Only around a quarter (27%) said their day was going particularly well, and not even one-in-ten (7%) admitted their day was going poorly. Africans and Latin Americans were more likely to say it was a good day (47% and 43%, respectively) and certain countries stand out for their more positive responses. For example, around half or more in Nigeria (58%), Colombia (57%), Nicaragua (53%), Kenya (52%) and Brazil (51%) said their day was particularly good. (For full results by country, see here). The U.S. is also one of the more upbeat countries when it comes to describing the day. Overall, 41% of Americans said the day was a good one, with nearly half (49%) saying the day was typical. Only 8% of Americans professed to having a bad day. Meanwhile, bad days were more common in Egypt (32% said it was a particularly bad day) and Jordan (27%) than in any other country, and the Middle East had slightly more bad day responses compared to other regions. Interestingly, Europeans stood out for being more likely to say the day was typical (a median of 76% across seven EU nations), with only 17% who said the day was good. Less than three-in-ten in every European country surveyed said the day was going well. And in Asia, a median of 68% said the day was typical, although 30% said the day was a good one. In Japan, almost nine-in-ten (89%) said the day was a normal one. As a matter of survey continuity, almost every Global Attitudes survey going back to 2007 has had this inquiry as the first. And generally, there is little variation in the responses over time. 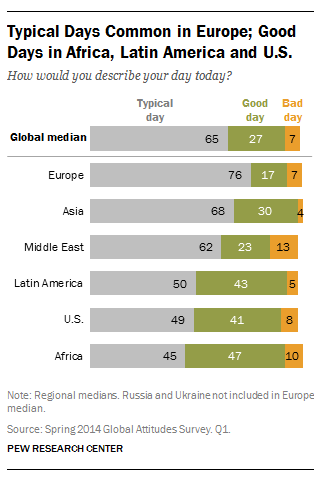 Across the 29 countries surveyed in both 2007 and 2014, a median of 67% said it was a typical day in 2014, while 68% in the same set of countries said this in 2007. 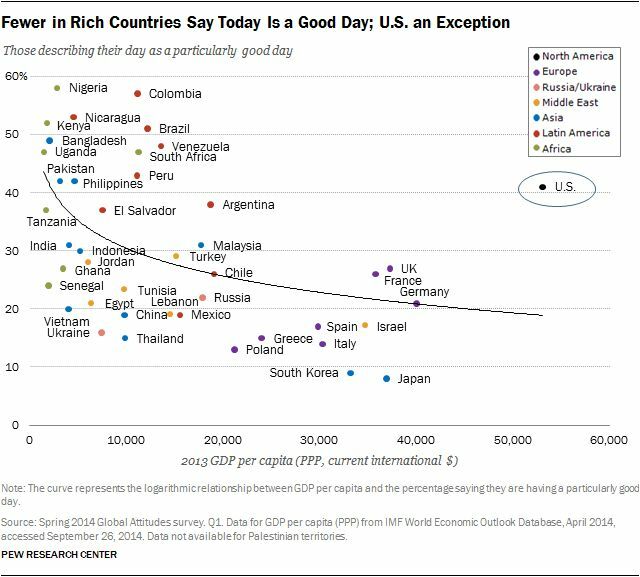 ‘Particularly good days’ are common in Africa, Latin America and the U.S.